A school near Spilsby has solved the problem of congestion at dropping off and picking up times by creating its own filter lane for vehicles. Six spaces for parking and pulling-in have also been created outside Partney Church of England Aided Primary School in Maddison Lane. Clare Dawson, the school business manager, said: “The pull-in was much-needed as we are situated on a narrow lane, which became quite congested at school starting and finishing times. “The children could only walk down the narrow lane, or across the school car park. “We used a combination of a grant and our capital funds to finance the project. “It has made so much difference – we now have six parking/pull-in spaces with our own filter lane taking the school traffic away from the lane, leaving it free for the residents and through traffic including emergency vehicles. The filter lane and parking spaces were not the only changes when children started back after the summer holidays. “The field had always been very uneven so we used the soil which was removed from the front to make the pull-in and levelled it all out and reseeded it,” said Clare. “It did mean the children had to have their sports day in one of the School Governors’ front garden this year, but it was all worth it. “Now we have a level football pitch to play on. “We have used grant money to pay for the new fencing for our garden, for the EYFS stage and the playground markings. 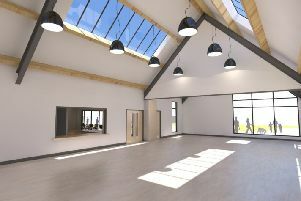 Partney School is hosting a Meet the Schools event on October 9 from 3.30pm to 5pm for parents of pupils starting school in September 2019. This will include Spilsby Primary Academy, Halton Holegate Primary, Toynton All Saints Primary, Great Steeping Primary and Partney Primary School.